This is a limited licence for 3 different ITH (in-the-hoop) Silhouette Zipper Bags for the 5x7 inch hoop. The bag styles are shown in the 2nd picture. With this purchase you'll receive the right to use the blank files as per described to your licence, also 3 different bags as shown in picture 2 as well as a step-by-step PDF instruction with lots of pictures, written in English and German. These bags are blank files of the many different variations with motifs that are available in my shop. Purchasing and holding a limited licence for these particular bags allows you to add names and motifs legally and sell them offline (only). It does NOT allow you to sell these finished items online. If you wish to sell your finished modified or customised items online, you must purchase an unlimited licence. *You must be able to provide me with your licence key (which is the order number of your purchase) at any time if required. Each licence key is unique and will only be generated one time for each purchased licence. 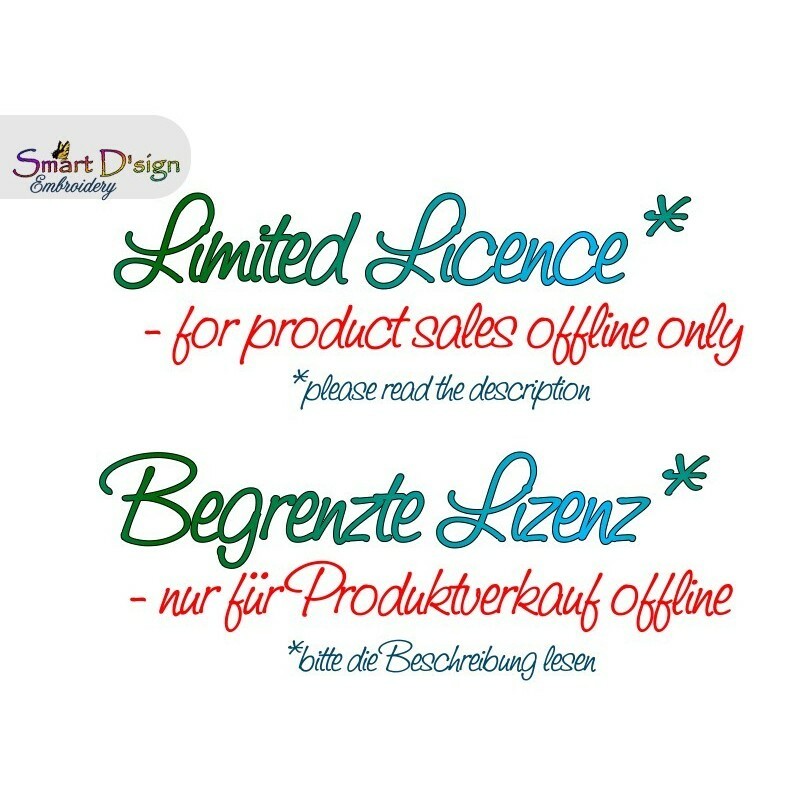 Please do not forward/share your purchased design(s) with any other person, as your licence key is only valid for yourself as the licence holder. By purchasing any of these licences you fully agree to these terms & conditions. 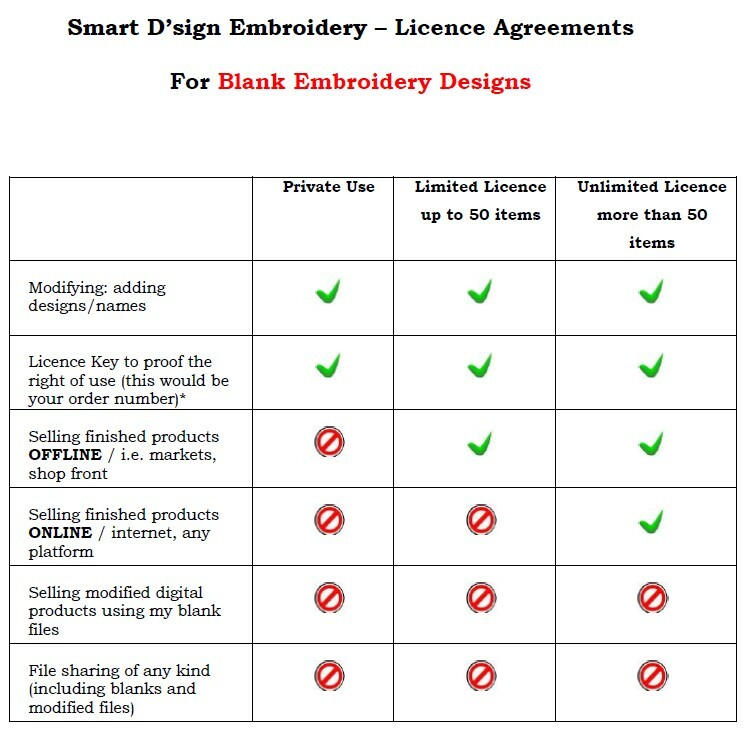 As a private licence is for private use only, you’re not allowed to sell any finished products. If you have a business, you’re welcome to use my blank designs to produce customised finished products for sale. However if you want to sell online, i.e. on Etsy, eBay or any other platform or in your own web shop, you MUST purchase an unlimited licence. Limited licence gives you only the permission to sell offline such as markets or in shops with a street front. My licences for the blank designs have the same terms & conditions regarding the right of revocation and refund like all my other digital items. They are non refundable. Please read the Terms & Conditions before purchase. If you have any questions regarding the different types and use of licences please contact me prior to purchasing. Thank you.